Option 1 is the one that seems to be working better than others. It’s similar to Option 2 as it also starts a new process, but handles the output way better than Option 2. It basically starts a new process as UserB and then grab the output, stored in $GetProcessResult. The comments should explain everything on what the script is doing. #Define a result file where to temporarily store the output of the process. write-error "File $($ResultFile) does not exist!" Very similar to Option 1, this way to run a command as a different user in Powershell has one flow: it’s not possible to grab the output from Start-Process, unless it’s redirected to a file! So that means we need to store the output somewhere and then grab it back. Thankfully, the file is created as UserA, which means we can target UserA’s %temp% folder to store it. The above script will also delete it afterwards and at the beginning of it, should the file already exist for some reason. This one’s my favorite to run a command as a different user in Powershell, however it does have an issue and you may receive the error below in case you’ve got a mapped drive on UserA’s profile: An error occurred while starting the background process. Error reported: The directory name is invalid. So, there are a couple of ways to fix this but unfortunately, I don’t like them and I don’t think the’re good solutions. The first solution would be changin the “Start In” setting in the Powershell shortcut (in Windows 10 it’s located here: %appdata%\Microsoft\Windows\Start Menu\Programs\Windows PowerShell). 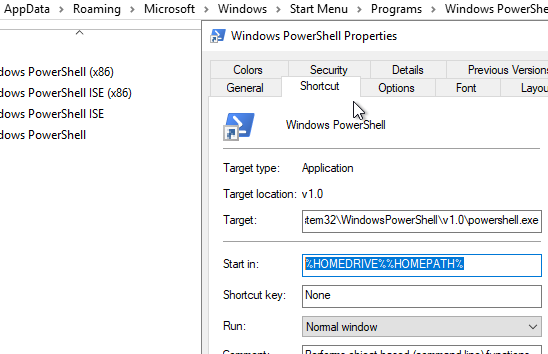 You must change %HOMEDRIVE%%HOMEPATH% to something like %WinDir% for example. If you don’t want o edit the original shortcut, you can just clone it and edit the cloned one. Once done, you can just double click on it as UserA and you should be good. This won’t require admin rights, but it requires a restart of the console if you have it opened! So basically, the script checks if the file already exists, if it does, it renames it, creates a new one which includes $ProfilePS1’s content, finally runs Option 3’s script, deletes profile.ps1 and reverts back to the old one (if existed). If UAC is enabled, you must make sure you’re running this as Administrator! Unfortunately, using Set-Location in the current session before hand, won’t work.